Choral director Jeffery Davidson leads men's chorus through a piece. Whitman's men's chorus is an award-winning ensemble composed of 44 boys. “Listen, I might not have the words to ‘Vive l’Amour’ down straight, but I know damn well what I’m about to say to you today,” a Whitman senior said to the reception of rousing applause and laughter. A chorus of 50 boys wearing black suits and Carolina blue ties listened giddily as the senior spoke before their performance at the Festival of the Arts last May. I was grinning from ear to ear, hardly able to contain my excitement for my first full-length concert with the ensemble. But only six months earlier, I couldn’t imagine I would be taking a music class, much less performing in a concert. The one thing I did know at the beginning of sophomore year was that I was unhappy. School days blended into one another in a constant stream of drudgery, leaving me discouraged about my remaining three years of high school. Sure, I had great friends and some interests outside of school, but I didn’t feel a strong sense of community at Whitman. When my friend suggested that I join men’s chorus, I was initially resistant to the idea. I assumed chorus was only for theater kids, and I associated choral music with little boys wearing white robes who sing hymns in churches. I was afraid that I would be seen as “unmasculine” if I joined. But when I first listened to men’s chorus perform an arrangement of “The Wreck of the Edmund Fitzgerald” in a rehearsal—complete with a baritone soloist and a pair of guitars—I was stunned. The short time I spent watching the group negated all of my preconceived notions. As I scanned the room, I saw guys that I never expected would sing. Sure, some did theater, but others were swimmers or track stars. I quickly realized that it was silly of me to try to fit them all into one box. Virtually the only commonality among them was the only thing that mattered: they enjoyed singing. Since then, chorus has given me some of my best friends and fostered some of my most memorable experiences, like participating in a cappella and singing in the all state choir. Chorus provides an opportunity for everyone involved to leave their individual stresses behind to create something greater. For 45 minutes every day, we forget the complexities of our individual lives to make music as a whole. Mr. Davidson, our director, tells us that “singing in a choir is a selfless act,” and it really is. But high school men’s ensembles aren’t something that can be taken for granted. 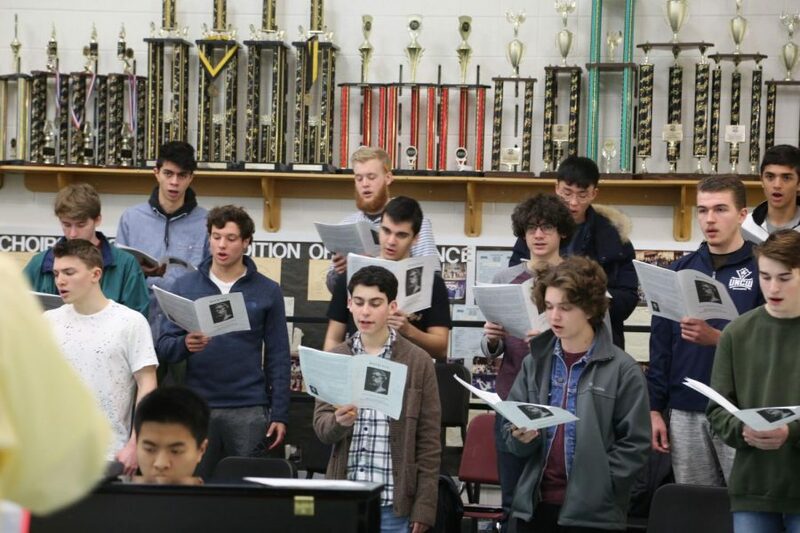 Whitman’s men’s chorus is only one of three such groups in the county and is expected to have about 20 fewer singers next year because not as many boys are signing up. I shudder to think that these “choirboy” misconceptions almost prevented me from joining. Most of all, I worry about the boys who would benefit from such a tight-knit community but refuse to join simply because of some imaginary stereotype. But if we are able to look past the stereotypes surrounding men in music, boys won’t be afraid to give chorus a try, and groups like men’s chorus will be judged only on the quality of their music. This story was originally published on The Black & White on March 22, 2019.